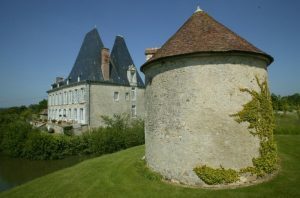 Dismiss any thoughts of the French chateau being a stuffy, precious place, reserved solely for those with a fat wallet. These chateau B&Bs are not only great value but family-friendly too. Many have spacious family suites that can cater for the larger family and evening meals suitable for children are often provided. Adults and children alike will be enchanted by this 1000 year old castle complete with a moat, battlements and a dungeon too! A stay here is guaranteed to fire up the imagination and is one of the most authentic family-friendly French chateau B&B experiences you can hope for. 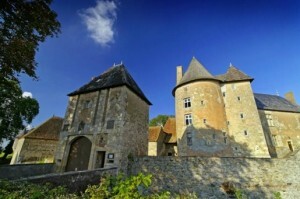 Dominique thoroughly enjoys welcoming families to her home just to the north of Clermont in the Auvergne and delights in sharing the rich history of the place with her guests. 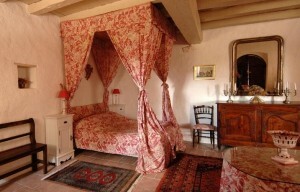 The family suites include four poster canopied bedsteads for the adults and bedrooms in the tower for the children. The bathrooms have fortunately been upgraded since Medieval times. Thankfully the same can’t be said for the lovely big old stone fireplaces which are a feature of many of the rooms. The suites and family rooms at the castle won’t break the bank either. This really is a great value chateau B&B experience. 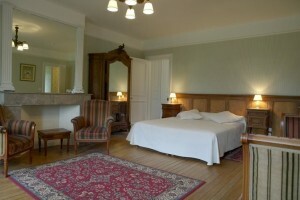 This fine chateau B&B near Abbeville in NE France is full of homely goodness and unpretentious but classic French style. Just an hour down the coast from Calais, a stone’s throw from the beaches of the Opal coast, it’s a fantastic choice for a family short break to France. The chateau is a fantastically welcoming place where children of all ages are welcome. Accommodation is either in spacious family rooms or family suites in which large families of up to 5 people can stay. The stables at the chateau are the big attraction for families. 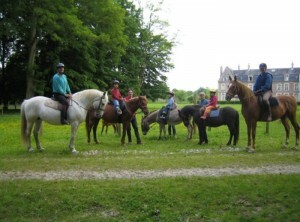 The whole family can hire horses and ponies for a half or a full day to explore the land that surrrounds the chateau. That pony-mad daughter of yours will be in her element! You won’t need to worry about having to head out to find somewhere to eat in the evening either. Norbert provides delicious evening meals and caters for adults and children. 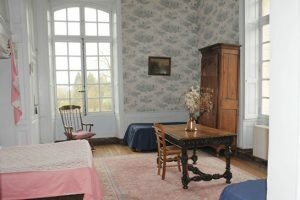 Stay at this 16th century family friendly chateau near Paris and you get the best of both worlds. It’s out in the countryside just to the north of Paris and yet only a 45 minute train trip to the city centre. If the kids are bugging you for a trip to Disneyland Paris, that’s very doable from this chateau too. 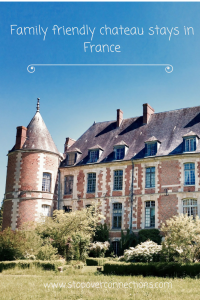 There’s nothing strict or formal about this lovely old Renaissance chateau. British Shirley and her French husband Jean-Louis genuinely enjoy sharing their historical home with their guests of all ages. The kids have the run of the 40 acres of parkland although they may have to share it with deer, foxes and the ducks on the pond! After being cooped up in the car for hours you can happily let them loose to work off that pent-up energy. They can explore the woodland, make dens or just have a kick about with a ball. 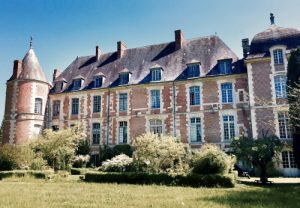 Staying in a family friendly chateau in France is a great experience for families with children of all ages. Whether you only have time for a stopover en route to your holiday destination in France or fancy taking a long weekend break across the Channel, introducing your family to French chateau life needn’t cost the earth. Plus it is guaranteed to provide your family with memories that will last a lifetime. What are you waiting for!